Bishop Chatard High School is first and foremost a faith community. As a faith community, the most important thing we do is pray. Prayer is a powerful tool, especially when an entire community prays for and with one another. To that end, Bishop Chatard has established a community prayer chain. 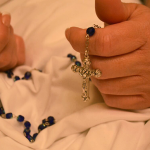 When someone in the school community is in need of prayers, or knows of someone who is, he or she can submit a prayer request. That prayer is added to a list that is sent out weekly. We ask community members to sign up to receive the prayer list via e-mail so that they may include the needs of this list in their daily prayer. If you would like to know who needs your prayers each week, please fill out and submit the form below to be included in the email list.